I thought today would be the perfect opportunity to repost an old post from two years ago. If you hosted Thanksgiving, or got stuck taking home way too many leftovers, here's a great way to refresh all that stuffing! Looking for a new way to serve those Thanksgiving leftovers? 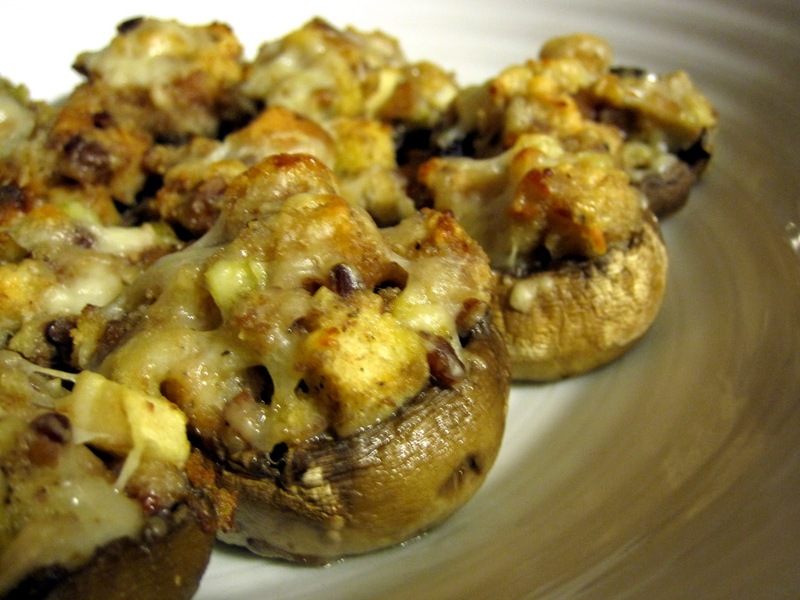 Earlier in the month at my "Dinnerless" Dinner Party, I made these great Stuffing Stuffed Mushrooms as hors d'oeuvres . They were so easy to make and very tasty! I'll definitely be doing this again with all the stuffing that's hanging out in my fridge. Preheat oven to 400°F. Break up stuffing into bowl. Add 3/4 cup cheese, egg, parsley, basil, and green onions; mix well. If mixture seems dry, add 1 tablespoon olive oil to moisten. Season with salt and pepper. Such a good idea! We have a whole thing of stuffing sitting in our fridge...yum! mmm, that looks so delicious! i want to try some right now!!! LOL.